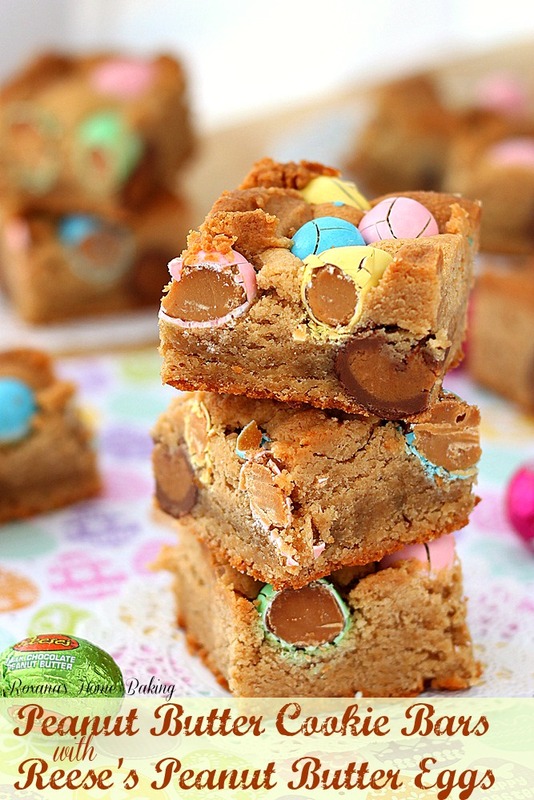 Peanut butter cookie bars with Reese’s peanut butter eggs – just like a melt-in-you-mouth peanut butter cookie with an extra peanut butter touch I’ve been meaning to use Reese’s colorful Easter Eggs in baking since I saw them on the shelves just before Valentine’s day. Of course I ate a few bags before I actually used some, but hey, that’s the taste testing part. 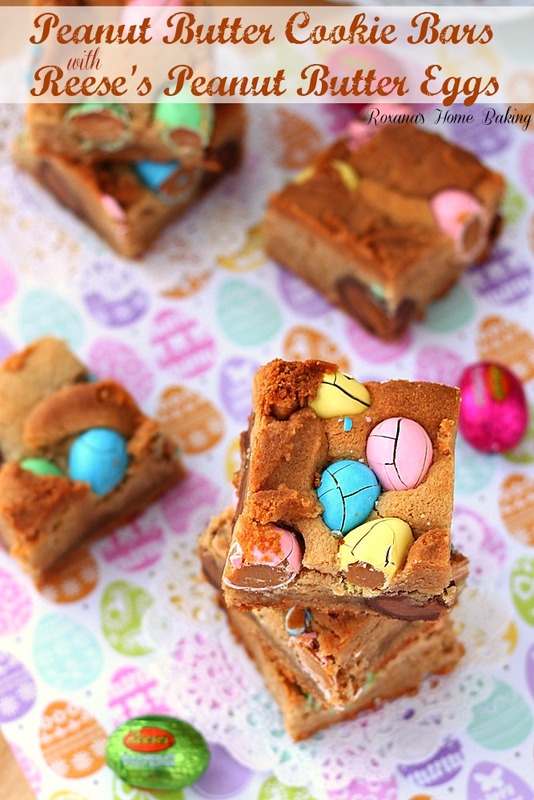 These peanut butter cookie bars with Reese’s peanut butter eggs may have a long and sort of complicated name but there’s nothing complicated about making them. 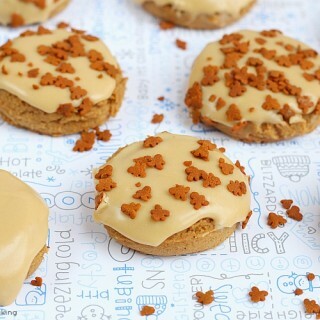 And the taste, mmm, just like a melt-in-your-mouth peanut butter cookie. Soft, crumbly with a strong peanut butter taste and the addition of both peanut butter chocolate eggs and candy peanut butter eggs improves their texture and color. And since I got a little excited about these Reese’s eggs I used two whole bags. The peanut butter chocolate ones I buried them inside the cookie dough for an extra peanut butter surprise and topped with the colorful ones. All I can say it’s Peanut Butter Lover’s Heaven in one bite. If you don’t have Reese’s peanut butter eggs on hand you can use the chocolate peanut butter cups or, for a chocolate touch you can use Hershey’s milk chocolate eggs or the Reese’s pieces, like M&M’s. Whatever you choose these peanut butter bars are worth making them. 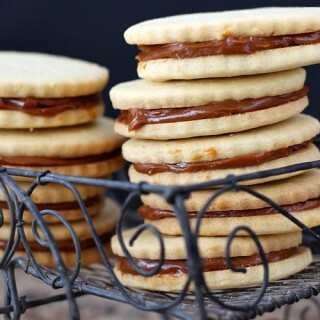 And not only they are irresistible, they are so easy to make. 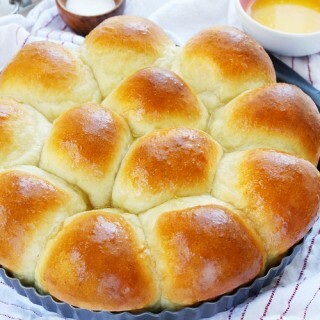 You start by creaming the butter and peanut butter with the brown sugar until creamy and fluffy, add the eggs and flour and spread the dough in the prepared pan. Add the Reese’s eggs and bake. It’s that simple. The hardest part? Unwrapping a whole bag of Reese’s Peanut Butter Eggs!!! Heat the oven to 350F. Lin ea 13X9 baking pan with parchment paper. Set aside. 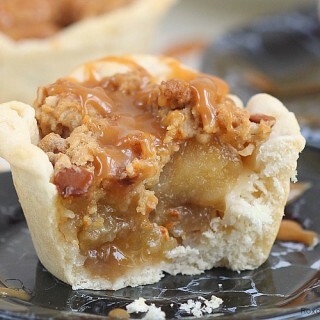 In a mixing bowl cream butter, peanut butter and brown sugar until light and fluffy, for 2-3 minutes. Add the eggs, scraping the sides of the bowl down. Slowly, add the baking powder and flour and stir until well mixed. Reserve 3/4 cup cookie dough. Spread the remaining cookie dough on the bottom of the prepared pan and here and there press in the Reese's Chocolate Peanut Butter Eggs. Spread the reserved 3/4 cup cookie dough on top of the chocolate peanut butter eggs. Top everything with the pastel egg candy. No need the press them in. Bake in preheated oven for 33 minutes or until the sides start to brown and a toothpick inserted in the middle comes clean. Leave to cool completely in the pan before cutting them. Roxana, these are just darling! I love the egg background. 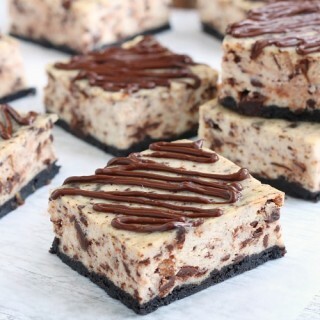 I am a big fan of peanut butter...And these bars look so tempting!!! Great job with the photography, Roxana! You know I love my peanut butter, I am pretty sure a whole pan would be done in a day with me around! These look incredible, Roxana! Love the peanut butter! Hahahah I LOL'd when you said the hardest part is unwrapping the eggs! I seriously hate that part when baking with candies. But these bars look all too good! I seriously have eaten so many Reese's easter eggs, they are just too darn good! I love these Roxana! Those eggs are addicting! These are so stinking adorable! I love the beautiful pastel colors and anything peanut butter wins me over hands down. OMG I LOVE THESE! 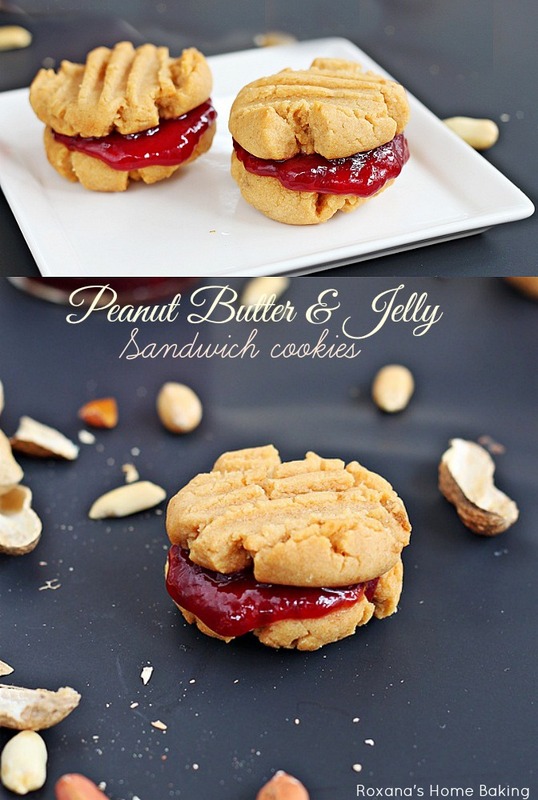 Peanut butter cookies with PB eggs? Genius! These just pop off the screen! They look to die for. You make the yummiest desserts. *claps* Reese's in baking make the best, peanut buttery, treats! These are sinfully delicious looking, Roxana! OMG!!! These look great! Do you think that the peanut butter M&M's would work instead of the Reese's Chocolate Peanut Butter Eggs? I haven't seen the Reese's Eggs this year, I thought I would try to swap them out! These bars are so pretty with the pastel eggs and I know they are tasty too. Peanut butter eggs are one of my favs. and put them in peanut butter bars, oh yeah! And we are all so glad that you did finally use those eggs! YUM! The Reese's Pieces eggs are the best! I don't know why but they taste better than regular Reese's Pieces. Adding them to bars is a great idea! We're having an Easter party at home, so these will be perfect for the kids...and adults alike! 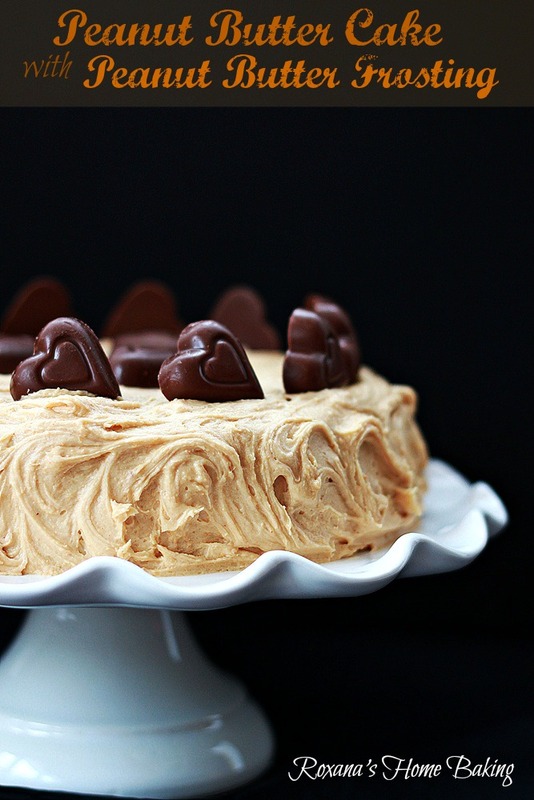 We love Reese's peanut butter-anything at home. My husband will be in heaven when he sees / tastes these! another awesome recipe, Roxana! I always have to buy extra bags of Reese's when I want to bake because I can't stop eating them! 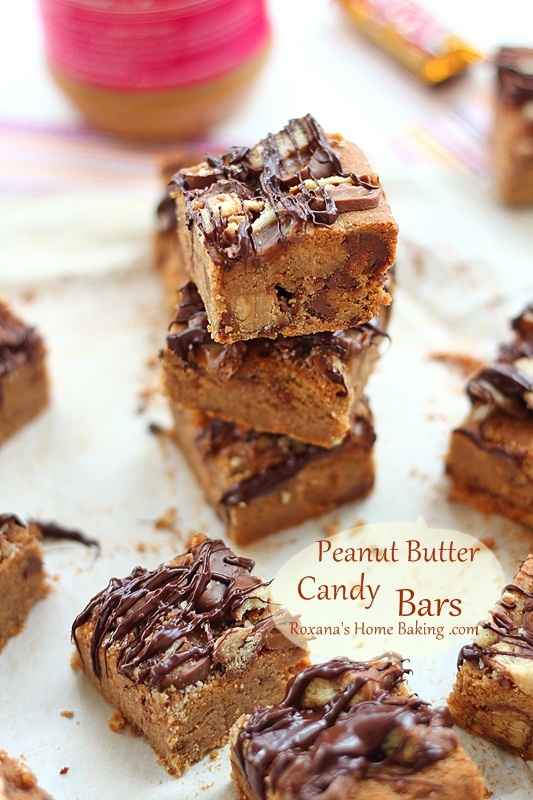 These bars are insane...I love love LOVE all the peanut butter action going on in them!!! I need to go stock up on Reese's peanut butter eggs and candy pastel eggs and all kinds of peanut butter treats so that i can make this asap! Love these, Roxana. And they're too adorable for words. You always come up with the perfect holiday-themed treats! Glad I'm not the only one who "taste tests" their candy before baking with it. ;) Could you please send over a batch? 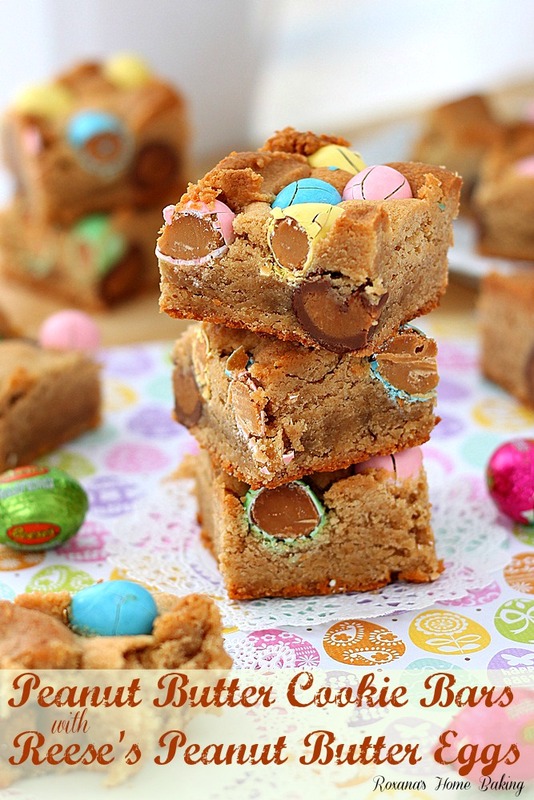 Peanut butter bars filled with peanut butter eggs...I think I just escaped into Easter heaven!!! Amazing, Roxana! What a perfect treat for Easter! My nephews would adore these bars. Divine! Roxana, these look amazing! I love those reese's eggs and look forward to them every year. 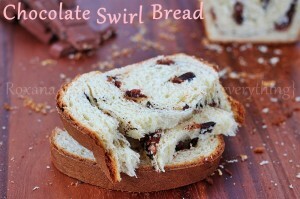 I can't wait to get a bag and try this recipe! 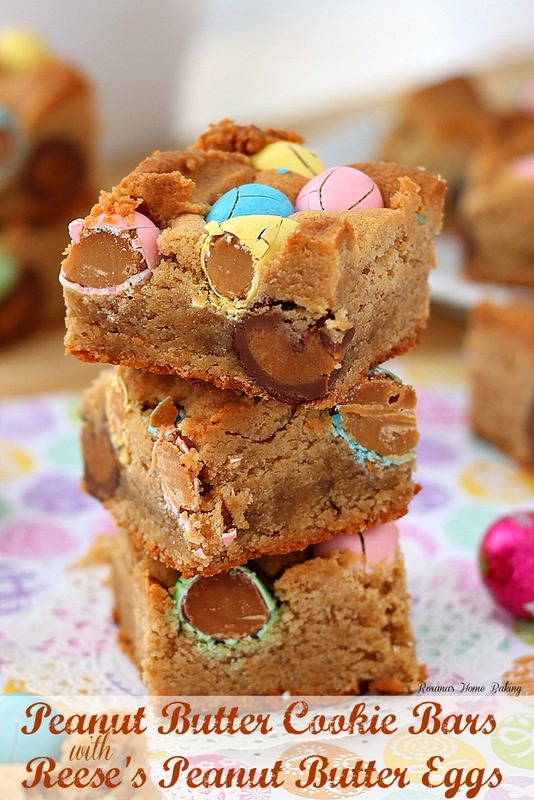 These would be such a hit with my family for Easter dessert! I haven't had sugar in a while, and these look SOOOOO good! You've had fun with the Easter candy these days. Now I'm inspired to do something different with them. :))Love the peanut butter flavor!